This is a doubly-linked list implementation. A linked list allows easy insertion and removal at either end or in the middle. 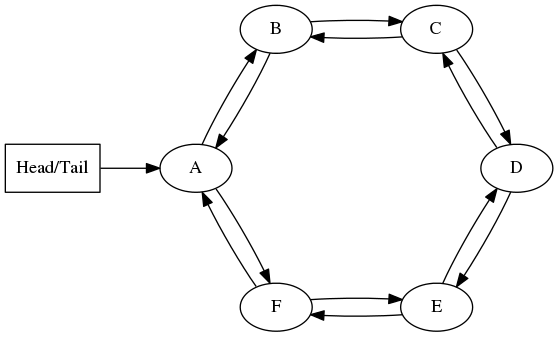 Being doubly-linked allows traversal in reverse as well as forwards. A circular linked list is a linked list in which the head node’s previous pointer points to the tail node, and the tail node’s next pointer points to the head node. This means that the list only needs to keep track of one pointer for both head and tail. Looping over a circular linked list is slightly different from looping over an ordinary linked list because there is no NULL node to detect, and instead you are trying to get back to where you started. There are 2 methods of doing this.